Protein World is a UK company known for its controversial ‘Are You Beach Body Ready?’ ads featuring bikini-clad models, ads which sparked such controversy they were banned by the London mayor. Ironically, the company went from strength to strength on the back of such publicity, and now has a wide range of weight loss products sold throughout the UK, including Protein World Fat Metaboliser. The Fat Metaboliser capsules promise to reduce fatigue, support alertness, and contribute to fat metabolism. In short, it’s a fat burner, but is it a good one? Protein World describes the choline in their Fat Metaboliser capsules as “an extraordinary ingredient” for breaking down fat. It’s not an ingredient you often see in fat burners – probably because it’s not the strongest weight loss ingredient on the market – but in theory it could help you lose body fat quicker. Choline is a non-essential macronutrient with a lipotropic effect, meaning it encourages the body to use fat as a source of energy and prevent fat from depositing in the liver. Helping the body to burn more fat than usual at your typical metabolic rate, choline can be a decent weight loss ingredient, though isn’t as effective as other traditional fat burning ingredients such as Green Tea (also included in this formula). The increased rate of lipolysis, however, may help to prevent future weight gain as well as current weight loss and choline may be less prone to side-effects than some ingredients on the market. Choline may also encourage satiety, with a study by Louisiana State University Pennington Biomedical Research Center in 2007 demonstrating that eggs for breakfast, naturally loaded with choline, helped obese patients on a low-fat diet to lose weight. Granted, that was when following a 1,000 calorie-deficit diet. Overall, not a bad ingredient but could have been stronger if Protein World had opted for a more dedicated and recognised fat burner such as Green Coffee. Choline is also an effective nootropic and is vital for both brain and body health. As the body can only synthesise a small amount, the rest needs to be consumed either through diet or supplementation. The FDA recommends a daily dose of 550mg for men, 425mg for women. 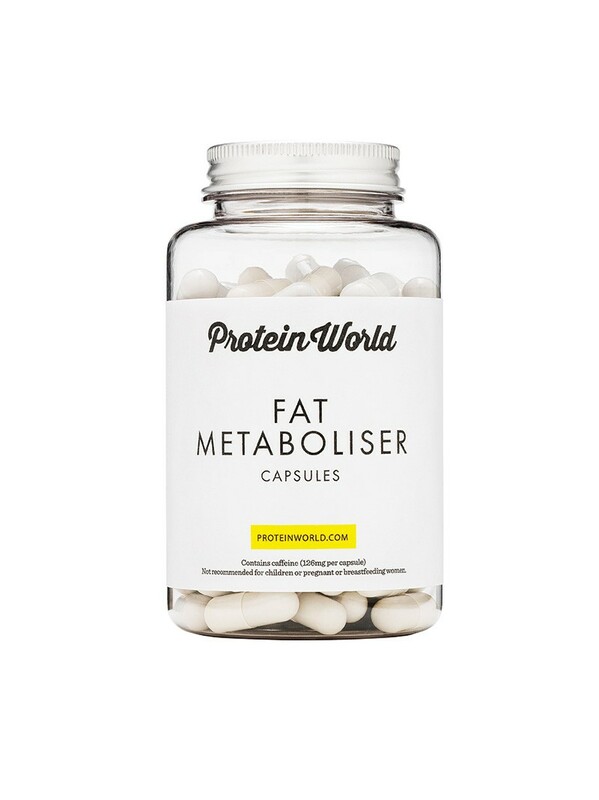 Protein World’s Fat Metaboliser supplies 100mg, so it isn’t the strongest dosage. We love green tea, and you’ve no doubt heard us describe it as one of the best fat burning ingredients around. Several studies demonstrate that the caffeine and catechins in green tea help to boost your metabolic rate, elevating levels of norepinephrine, the fat-burning hormone, and kick-starting thermogenesis. But, and here’s the downside, you need to drink or supplement a relatively high amount in order to experience its potential weight loss effects. According to the University of Maryland Medical Center, you’d need to drink two to three cups of green tea a day. Depending on how it is brewed, each cup can have between 120 to 320mg of catechins, alongside 10 to 60mg of caffeine. Multiply that by two or three, and you have some idea of how much you need. To give you a further guide, our second and third placed Best Fat Burners of 2018, Hourglass and Instant Knockout, both contain 500mg of green tea, an ideal amount. So how much does Protein World Fat Metaboliser contain? Just 200mg. A missed opportunity. Caffeine, a regular stimulant added to most commercial fat burners, is one of the chief ingredients in Protein World Fat Metaboliser. Caffeine helps to move fat from your adipose tissues and speed up the rate at which it is metabolised. Caffeine also boosts your resting metabolic rate by between 3-11% according to studies, boosting the rate at which your body gets rid of calories while resting. Protein World Fat Metaboliser contains 200mg of caffeine, almost equivalent to about two cups of coffee. This by itself is pretty standard for a fat burner but take note — that dosage is for two capsules and Protein World recommends eventually using four capsules a day. That’s a lot of caffeine in total. Plus, beware the overall stimulation when mixed with other ingredients containing caffeine in this blend. Sourced from the rainforest areas of the Amazon Basin is the climbing plant Guarana. Research has proven that Guarana seeds have twice the amount of caffeine found in coffee seeds. The seeds have a concentration of 2-4% of caffeine, as opposed to the 1% contained in coffee seeds. In countries like the United States, Guarana seed, powder and fruit have not been certified ‘generally recognized as safe” by the FDA; however, it has gained approval for use as a food additive. More on potential interactions with guarana.. Note that while guarana is used in fat burners for its caffeine effects, there’s little else to be said for it as a direct fat burner. Continuous intake of alpha lipoic acid over a period of time is thought to speed up the rate at which the body burns fat, but it’s generally not considered an important fat burning ingredient. The product uses 100mg of alpha lipoic acid, compared to the 300-1,000mg recommended for daily intake so it’s unlikely to do much anyway. This is a strange one. Despite claims that L-Tyrosine can boost metabolism, there is no clinical evidence to prove that it helps with weight loss. Some studies, however, have suggested that it may help to suppress appetite when used with weight loss products containing caffeine. Even if it does the latter – and it’s still debateable – there are other proven ingredients out there that are much better for appetite suppressant than L-Tyrosine, the dietary fibre glucomannan for one. And yet more caffeine! Protein World Fat Metaboliser contains caffeine from four different sources – pure caffeine anhydrous, green tea, guarana (22% caffeine) and now Yerba Mate. That’s a pretty potent stimulant punch, especially if you’re not used to it. Yerba Mate may have less caffeine that you’d find in a cup of coffee or green tea but it is marketed for its ability to suppress appetite and burn fat, yet the research is still inconclusive. Unlike straight caffeine, no particular increase to metabolic rate has been noted with Yerba Mate, for instance. A lot of the excitement about yerba mate comes from research that suggests it may be a potential treatment for obesity, but the study was done on animals and has not yet been replicated in human clinical trials. As it simply adds to an already heavy stimulant package in Protein World Fat Metaboliser without being a proven weight loss tool in its own right, we would probably have avoided this ingredient. Cayenne pepper has been proven to help reduce cravings, curb appetite and burn calories, thanks to its active ingredient, Capsicum. An older study from 2003 found that eating cayenne pepper raised metabolism for 30 minutes. It’s a good choice for thermogenesis and suppressing the appetite and is included in Protein World Fat Metaboliser at 50mg. This could be an effective dosage if there were some other strong fat burning ingredients in here. As the supplement is missing some of the obvious choices, however, the cayenne pepper dosage could have been increased. Pyridoxine or vitamin B6 is particularly useful in a fat burner for its ability to turn glycogen stored in the body into glucose, helping break down fat to be used for energy. It helps to increase the metabolism, boost the immune system, prevent food cravings thanks to its regulation of hormones and blood sugar, and helps to promote muscle growth. It also acts as an antioxidant and, another advantage when dieting, a nootropic, helping to regulate motivation and mood. The 5.6mg in Protein World Fat Metaboliser is generous at 400% of the daily recommended intake. It’s just a shame it’s not included in premium form P-5-P. If a weight loss product tells you that vitamin B12 can help to burn fat, don’t believe them. There is so far no clinical evidence that it is true. It may, however, be useful for boosting energy, which can help your exercise programme. The 25µg included in Protein World Fat Metaboliser is 1000% more than the daily recommended amount for some reason, but as there are no reported health risks identified with taking large amounts of vitamin B12, it shouldn’t be harmful. Protein World’s Fat Metaboliser is free of allergens, gluten-free, lactose-free and soy-free. It is safe for use by diabetics. Contains a bit too much caffeine for us to be comfortable with it and may well cause caffeine-related side-effects. Has mixed customer reviews, only earns a 2.6 out of 5 stars on Amazon UK at time of writing with, granted, only 15 reviews. Most fat burners nowadays include Bioperine, a premium form of black pepper which aids absorption of all other ingredients. If Protein World found another 5mg for this, this fat metaboliser could be so much more effective. The following two customer reviews are taken from Protein World’s website — click to enlarge. The following reviews come from Amazon UK — click to enlarge.. Protein World recommend taking one capsule in the morning and one in the afternoon with water for one week , bumping up to two capsules morning and afternoon from week two or whenever you feel ready. Warning – that’s a heck of a lot of caffeine in one day. The side effects in Protein World Fat Metaboliser all come down to its high caffeine content. Some users report sleepless nights, others warn of increased anxiety and jitters. Many on the Superdrug website warn of sickness for the first three or four days until the body adjusts to the caffeine. The question is whether you want to become used to so much caffeine. Individuals who are over age 18 can use the product, though with the company’s infamous ‘Are you Beach Ready?’ supermodel bikini adverts, it seems more skewed towards women. Not suitable for children or pregnant women. As an energy booster, Protein World Fat Metaboliser might do good things. After all, most of the ingredients seem more directed to boosting energy levels than directly burning fat. As a fat burner, however, reviews seem mixed. I don’t know about you but after analysing the contents of Protein World Fat Metaboliser, my takeaway is that it’s all about caffeine, caffeine, caffeine. 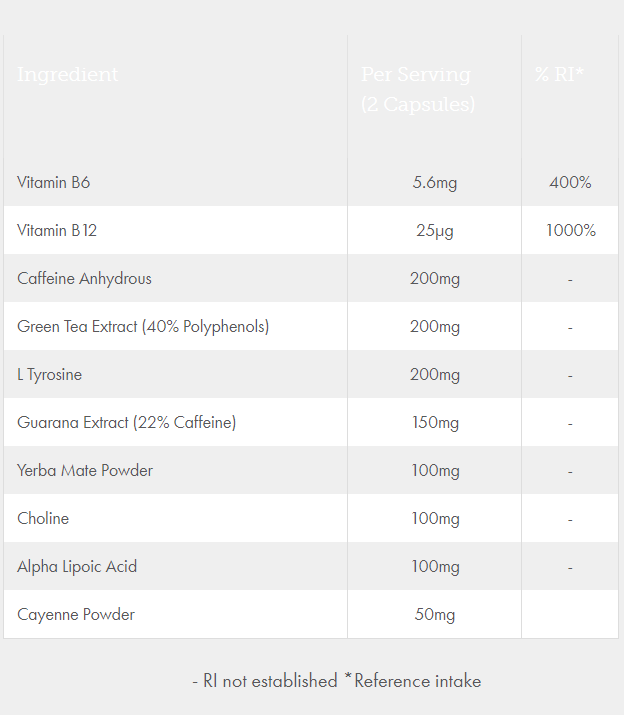 Four sources of caffeine in one supplement – some that do very little to burn fat directly – does seem overkill, especially when the manufacturers have ignored more potent fat burners to include them all. Yes, caffeine can increase energy levels and elevate the metabolism, but too much comes with dizziness, nausea, insomnia, fast heart rate, anxiety and more. Surely you shouldn’t need to go through that just to lose weight? This product may come in handy if you’re looking for a cheap fat burner to keep you fired up, during and after a workout. And yes, it does have some ingredients with health benefits; some that could even be good solid fat burners if only they were included in higher dosages. Overall, however, there are much better and safer fat burners out there than Protein World Fat Metaboliser and they can help burn fat and boost energy without compromising the health of their users. You can buy Protein World Fat Metaboliser from the official Protein World website, Amazon UK or Superdrug.